Hat tip to Leanne O'Donnell on twitter for this case that might make you cheer for the underdog, Director of Consumer Affairs Victoria v Parking Patrols Vic Pty Ltd & Anor  VSC 137. Parking Patrols Pty Ltd was associated with Ace Parking Pty Ltd. Ace Parking is the operator of 24 car parks in the Melbourne metropolitan area. It takes leases of vacant blocks of land, erects signage and installs parking ticket machines at those sites. The third and fourth defendants, Kevin English and James English, organised the design, form and content of the parking tickets issued from the parking ticket machines operated by Ace Parking. Aside from operating its own car parks, Ace Parking also manages a number of large car parks. Parking Infringements was established as a separate entity at the instigation of Kevin and James English to protect the income of Ace Parking by patrolling Ace Parking car parks and issuing infringement notices to vehicles parked without a ticket or permit. Kevin and James English were responsible for the design, form and content of the infringement notices issued by the employees of Parking Infringements. 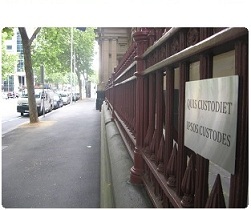 In May 2009, Parking Infringements changed its name to Parking Patrols Victoria Pty Ltd. Parking Patrols Pty Ltd issued put notices on cars in Ace Parking car parks suggesting the owners or drivers had committed "offences" and needed to pay a "fine". The Director of Consumer Affairs claimed this was misleading and deceptive, and sought various forms of declaratory and injunctive relief, refunds for people who had paid the fines, and public notices about the outcome of the proceeding. The applications weren't opposed, and most if not all of the Director's applications were granted. This has been an issue for some time — see for example The Age here in March 2011 — and the Consumer Law Action Centre has been working on it for quite a while, and has a useful fact sheet here.